New year means new resolutions for most of us and that consists in lots of new businesses for Glize and our partners. That’s the reason why we are extremely proud to announce our recent exclusive partnership with CuraLife which is bound to sediment our offer portfolio on the Health and Nutra verticals. 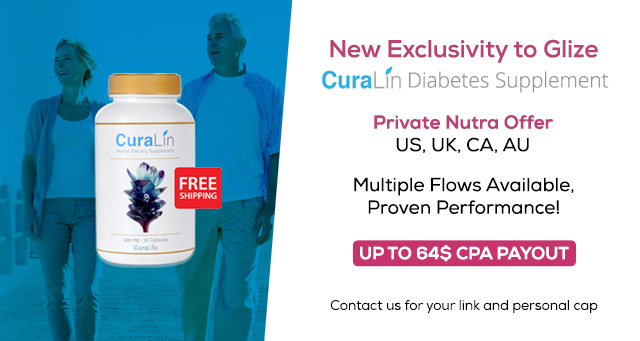 CuraLife are the producers of CuraLin, the latest proven diabetes supplement available on the market. The internal performance has already been tested, reaching over $1,50 EPC without a presale (GDN or Facebook). You can market your campaigns with real customer testimonials – written or video! Plus, all publishers are free to write their own copy for the ads and pre-sales, in addition to using their own traffic sources exclusively, if the volumes are right! The Marketplace hosts three vailable flows for Curalin: multi bottle, single bottle and a page promoting both of these packages, with CPA payouts as high as $64. All traffic sources are exclusive to Glize, so please reach out to your favorite account manager for your private Promolink and personal conversion cap. Setup will be smooth so you can start making some real money in no time at all!